VerifiedVPN Toolbar is a browser tool that is meant to help you access private network and allow you to surf the web anonymously, protect yourself from identity theft, and ensure safe connection to public hotspots. Even though these services might seem very attractive, many users end up removing VerifiedVPN Toolbar from their Chrome, Firefox, and Internet Explorer browsers. If you are reading this report, you might want to delete this suspicious toolbar as well. 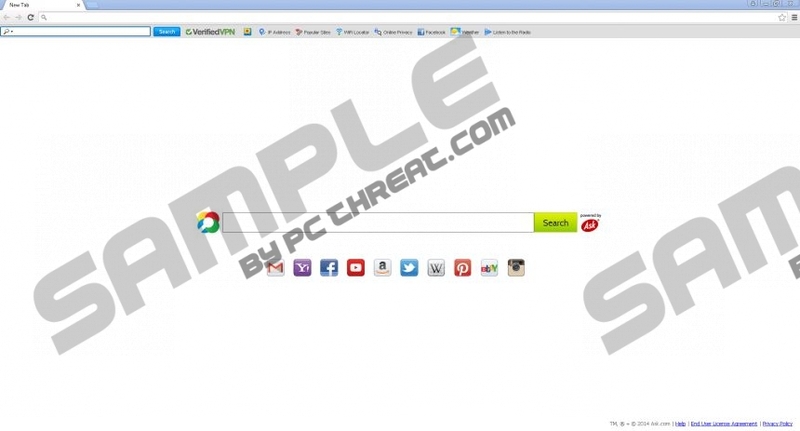 Continue reading to find out what has been discovered after analyzing this browser extension. The official source of VerifiedVPN Toolbar is verifiedvpn.com, but our researchers have found that the program could be bundled with malicious software as well. If you install VerifiedVPN Toolbar packaged with other programs, you HAVE to analyze them, even if they look harmless. If you discover that the programs installed with the toolbar are malicious, you must remove them ASAP. If you have downloaded the app from its official website, you might have to deal with third-party software as well. Some computer users tend to install programs without paying too much attention to the installation wizard, and these are the users who rush to delete VerifiedVPN Toolbar thinking that it is a browser hijacker. Even though we can help you remove VerifiedVPN Toolbar, we do not identify this browser extension as malicious. The developer of VerifiedVPN Toolbar is Mindspark Interactive Network, and it works together with Ask.com. This is why all of its toolbars, including MyTransitGuide Toolbar and DailyLocalGuide Toolbar, come bundled with Ask search tools. If you are careless, you might install Ask Search accidentally, but if you are cautious, you will get a chance to refuse the unwanted search tools. Our malware researchers indicate that Ask Search tools show sponsored search results, which is a reason to refuse them or to remove them if they have been installed already. If you do not want home.tb.ask.com to be the home page of you web browsers, and Ask Search is not the preferred search engine, you can follow our removal guide below. It is easy to remove VerifiedVPN Toolbar if you know the order of the removal steps. You can delete the toolbar easily using our guide below. Note that Internet Explorer users will need to uninstall VerifiedVPN Toolbar to remove the extension, and Chrome/Firefox users will have to delete VerifiedVPN Toolbar from the browsers. If you have discovered malicious programs installed with this toolbar, we advise downloading the automatic malware remover SpyHunter. Select the undesirable application (in Change or Remove Programs) and click Remove. Tap Win+R to launch RUN and enter Control Panel. Select Uninstall a program and locate VerifiedVPN Toolbar. Select Search Providers and set (Set as default) the preferred search provider. Select and Remove the undesirable search provider. Click Close. In the Tools menu select Options. Navigate to the Firefox search box and click the Search icon on the left. Select Manage Search Engines and Remove the undesirable search tool. Click OK. Simultaneously tap Ctrl+Shift+A to access Add-ons Manager. Select Extensions and Remove the undesirable add-ons. In the Chrome menu on the left select More tools and click Extensions. Find the undesirable add-on, click the trash icon, and select Remove. In the menu on your left select Settings. Go to On Startup and select Open a specific page or set of pages. Click Set pages and change/delete the undesirable URL. Click OK.
Move to Appearance, select Show Home button, and click Change. Identify the URL of the undesirable search tool, change/delete it, and click OK. Under Search click Manage search engines and set (Make default) the preferred search tool. Identify the URL of the undesirable search tool, click X to delete it, and click Done. Quick & tested solution for VerifiedVPN Toolbar removal.